Directions: Take the 800 North, Orem exit of I-15 (exit #273) going east on UT 52. After about 4 miles bear left at the US 189 intersection going up Provo Canyon. 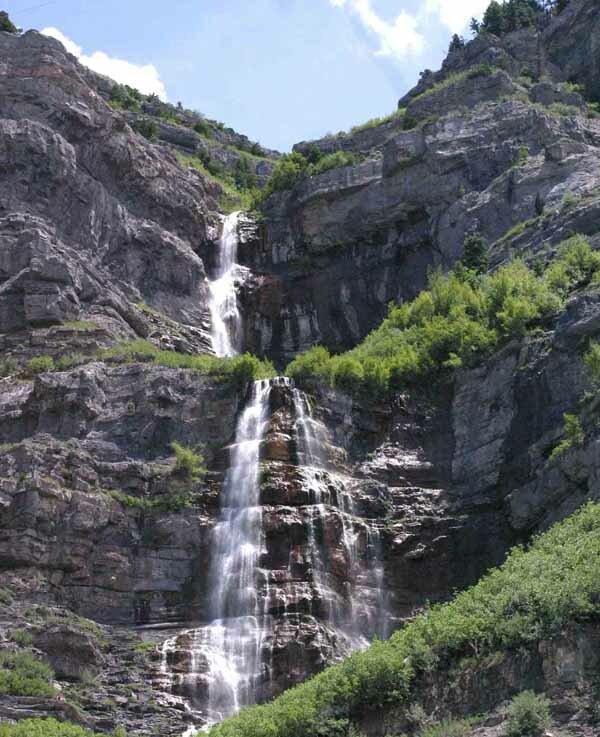 After about 2 1/2 miles you can turn off at the Bridal Veil Falls/Nunn's Park parking lot to access the Provo River Trail or continue about a half mile to the Bridal Veil Falls overlook which is directly in front of the falls.. Description: The double falls on the east side of Provo Canyon is one of the few know places that Black Swifts can sometimes be found. The trail at the bottom of the falls along the Provo River provides a good riparian habitat for birds, especially upstream towards. Birding: The Black Swifts nest behind the water fall on the rock ledges, but when not on the nest, they are usually on the wing all day looking for food. The swifts can best be observed from the overlook immediately in front of the falls early in the morning or in the evening when they are return to the falls.